Adding a cozy fireplace to your outdoor space means you can enjoy your yard or garden all year long. When you begin searching for the perfect outdoor fireplace, you should take four things into consideration. To start with, what kind of style you are looking for? Generally speaking, you can choose between a fireplace and a fire pit. After that, you can options for round, square and even tiered designs. It’s important to consider the size of your yard in relation to the size of fireplace you’re interested in. If you have a small yard, you may not want a large fireplace. 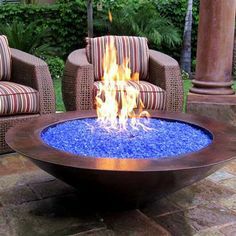 Instead, a small fire pit may work best. However, if you have a large yard, you have more options regarding the size you choose. Many people love the smell and sound of crackling wood, which is why it’s such a popular option. However, if you’d rather not deal with the cleanup that wood entails, you can always choose propane or gas. An outdoor fireplace can add interest and warmth to your home. If you’re going to incorporate one into your yard, hire a professional contractor to do the work. They understand the logistics and laws of installing outdoor furnaces, so it’s best to trust an expert in this situation.